Andrew Shaw #65 of the Chicago Blackhawks collides against the boards with Francois Beauchemin #32 of the Colorado Avalanche at the United Center on December 15, 2015 in Chicago, Illinois. The Avalanche defeated the Blackhawks 3-0. 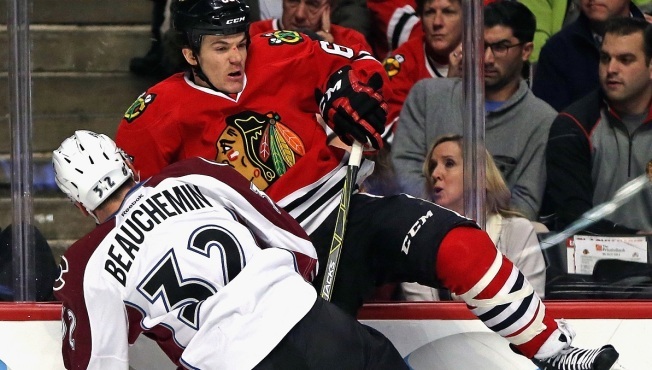 Chicago Blackhawks forward Andrew Shaw will not face supplementary discipline for his high hit on Colorado Avalanche defenseman Francois Beauchemin, the league announced on Wednesday. Shaw, who was assessed a two-minute minor penalty for the hit, did have his case reviewed by the league, but it was decided that the hit wasn’t worthy of any additional discipline. On the play, Shaw appeared to go after Beauchemin’s head along the boards, but he ended up taking the brunt of the impact as he slammed the back of his own head into the barrier. The Avalanche did not score on the power play that followed, but they did ultimately win the game 3-0. What do you think Hawks fans? Did Shaw get away with one, or did the league get the call right?